By the end of the 1960's, The Rolling Stones grew out of their rhythm and blues / skiff rock roots and turned into the chemical influenced sounds of psychedelica. 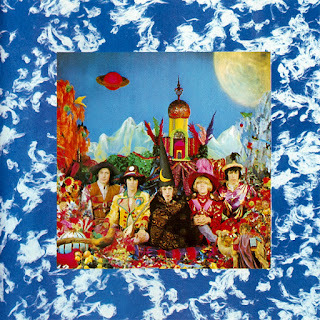 This all came to a head in 1967 with the release of Their Satanic Majesties Request. The album, which drew mixed reactions when released, featured the band dressed as wizards in a 3-D cover sitting on a magic carpet. This was not The Stones fans had grown to love, this was a whole new band. Working with new instruments like a Mellotrone, sampling sounds from short wave radios and hiring Led Zeppelin's John Paul Jones to craft the string arraignments, this record was far beyond and far out anything fans had heard at the time. It was also a record that took The Stones exploring to new themes. They tried to outdo The Beatles' sounds on Sgnt. Pepper, while they failed at competing with The Fab Four, they did craft a new mark in their own catalog. While it may not be the go-to Stones record for fans or was celebrated when released, it did help create the blueprint to psychedelic rock for generations to come. Put this record on and you will hear a clear influence it had on The Flaming Lips, Tame Impala, Portugal. The Man, Ghost of a Saber Tooth Tiger, and others.